The Pentagon has sent to Congress a list of military construction projects that could sacrifice their funding to pay for the border wall that President Donald Trump has declared a national security priority. The 20-page list of possible funding cuts would be worth around $12.9 billion, the Defense Department said. 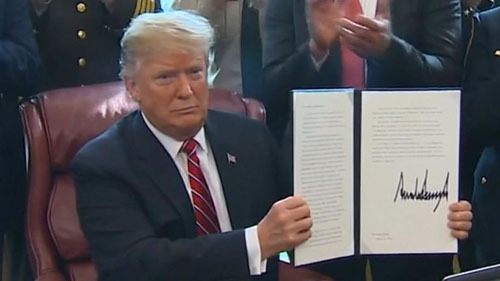 President Donald Trump vetoed a measure to overturn his border security emergency declaration. It was the first veto issued by Trump. Trump last week vetoed the vote by Congress to overturn the president’s national emergency declaration on border security. Some Democrats are hoping that the list of projects provided by the Pentagon might sway lawmakers to override Trump’s veto. The Democrat majority in the House has scheduled a vote on overriding the veto for March 26. In their initial votes to overturn the emergency declaration, the House and Senate both fell short of the two-thirds majorities that will be needed to override Trump’s veto. The Pentagon’s list included more than $100 million for water treatment plant improvements at Camp Lejeune and airfield security and other work at Cherry Point Marine Corps Air Station in North Carolina, the home state to Republican Sen. Thom Tillis. Tillis, who initially said he opposed Trump’s emergency declaration, wound up voting for it after reported backlash from GOP operatives in North Carolina. Tillis is up for re-election in 2020. “Trump’s endorsement is still the most sought-after thing for Republicans running for office. I’ve seen nothing that has equaled it in my political career,” Rep. Mark Meadows of North Carolina, chairman of the conservative House Freedom Caucus and one of Trump’s closest allies on Capitol Hill, told The Hill in a phone interview. Of the 12 Republican senators who joined all Senate Democrats in the vote to overturn Trump’s emergency declaration, only Susan Collins of Maine is up for re-election in 2020. In a letter accompanying the list of projects which could see funding cuts, Defense Department officials said they wouldn’t touch items for which money would be awarded by the Sept. 30 end of this fiscal year or for projects like housing. Included on the Pentagon’s list were an air traffic control tower at Fort Benning, Georgia; a maintenance hangar at Travis Air Force Base in California; and a drone hangar at Kunsan Air Base in South Korea.